Your Blood Pressure Could be a Risk Factor for Falls! Among elders, more than half have high blood pressure (hypertension). Hypertension leads to the risk of heart attacks, strokes, kidney disease, blindness, dementia, etc. Of equal danger, low blood pressure (hypotension) can result in dizziness, fainting and increased loss of balance. About 10%-20% of elders’ experience hypotension. Footwear helps support a person’s balance, which reduces the chances of slipping, tripping, and falling. According to a new study, up to 83% of older people wear the wrong type of shoes, including not using the correct size. This results in foot disorders, pain, and increased risk of falling. Are You Inactive? If Yes, Prepare to Fall! Around a third of people aged 65 and over and half of those aged 80 and over experience a fall each year. As a result, there are over 250,000 emergency admissions of elders to hospitals for falls every year. This is unfortunate, since many falls and fractures can be avoided by simple exercises that improve people's strength and balance. Avoiding Falls by Keeping Your Brain Fit As a person gets older, changes occur in all parts of the body, including the brain: • Certain parts of the brain shrink (such as the prefrontal cortex and hippocampus); both areas are important to learning, memory, planning, and other complex mental activities. Falling and winding up in the hospital is a problem for elders, many of whom have complex health conditions. The most common conditions leading to falls and hospitalization include: • Urinary tract infections • Adverse medication reactions • Poor disease management In many cases, these conditions are preventable by family caregivers. A family’s involvement in identifying and acting on potential warning signs, and keeping loved ones healthy and safe is an important role. In my health care practice, I see many elders who are ‘superagers’. These are people typically in their 60s and 70s (occasionally in their 80s) who exercise hard every day; some run or lift weights, others swim or bicycle. Consequently, the physical agility of superagers isn’t merely above average for their age, but is on par with healthy, active 50-year-olds. But superagers have one health concern in common; they tell me that their balance isn’t what it used to be, in fact, it has become quite wobbling. As we age, balance declines. There is no single reason for this, but weakening eyesight and muscles, and physical changes in the brain, all play a role. Although most people prefer to remain in the familiar surroundings of their own homes, home can be a hazardous place for an older person to live. According to the Centers for Disease Control and Prevention over 12,000 older adults die from falls at home each year and more than 1.6 million people over 65 need emergency medical treatment for fall-related injuries. If your older parent complains about chronic knee pain he or she may be a good candidate for a knee replacement. 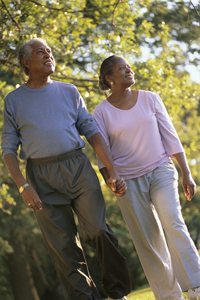 Knee replacements are one of the most common surgeries performed in the United States. Every year more than 300,000 people – mostly over 65 – undergo surgery to replace knees that have become stiff and painful after years of wear and tear. Most people who have had knee replacement surgery are pleased with the results. They can now walk, climb stairs, and enjoy activities they had to give up because of unbearable pain. Family members of older adults living at home often worry that their relative may fall – and rightly so. Falls are a leading cause of emergency room visits and a major cause of disability and death in people over 65. Most falls occur at home – either inside or outside the house. Older people often restrict their activities simply because they are afraid of falling.